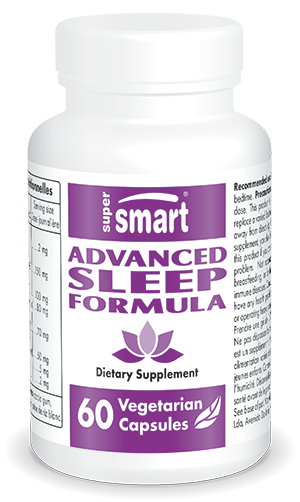 What are the ingredients in Advanced Sleep Formula? Sleep problems are one of the most common reasons for going to the doctor. When they’re not related to disorders such as anxiety or depression, they can be solved by taking a few simple steps, particularly ones using phytotherapy. Plant substances undoubtedly achieve the best results in this area. This is precisely what Advanced Sleep Formula offers: a combination of the safest and most widely-studied and tested plant-source ingredients. Very much in vogue, hawthorn is included in many products aimed at improving sleep problems. Its berries contain valuable flavonoids and procyanidins as well as a number of substances that act synergistically. Passion flower’s calming effects are widely-documented, though its mechanisms of action have yet to be established. Its efficacy is probably the result of synergy between the plant’s alkaloids, flavonoids, glucosides and a recently-discovered molecule, a benzoflavone moiety (BZF). A 2001 study showed that it may be as effective as a benzodiazepine-type drug widely-prescribed for anxiety (7). It also has the advantage of not causing drowsiness in the morning. Valerian has been used to treat insomnia for thousands of years and in many parts of the world (8-9). During the First World War, it was popular with European soldiers for calming nervous tension triggered by bombing raids and combat. It’s thought to reduce stress by acting on several of the brain’s chemical messengers. Some studies have also shown that taking valerian supplements improves sleep and reduces fatigue. This is a bio-active form of vitamin B6 which plays a key role in the transmission of nerve impulses and the production of neurotransmitters such as serotonin, melatonin, dopamine and gamma-aminobutyric acid. It’s an essential vitamin which the body must obtain from the diet (particularly meat and fish). It’s recognised as helping to improve sleep problems related to a lack of melatonin, as occurs with an unhealthy lifestyle, night shift work, over-exposure to screens or jet lag. prolonged release melatonin, such as in Melatonin Spray. The first helps you get to sleep more quickly, while the second is more suitable for those who experience wakefulness during the night. The scientific literature suggests that it is well-tolerated by both adults and children, and can be helpful for improving sleep (10-11). However, supplementing with low-dose melatonin (as contained in these products) should not be continued indefinitely. Melatonin is found in poppy seeds, which are included in this formulation, and in flax, coriander and sunflower seeds (12). California poppy (Escholtzia californica) is considered to be an excellent natural aid to sleep, as is hop, a tonic and nervous system relaxant, which also features in this product. Who is Advanced Sleep Formula for? a reduction in cognitive or physical performance due to the cumulative effects of lack of sleep. It is aimed more specifically at women, who tend to suffer from insomnia more than men, and at those over 50. What other measures can be used alongside Advanced Sleep Formula? Last but not least, it’s a good idea during the evening to eat foods high in tryptophan, an amino acid involved in the synthesis of serotonin and which promotes sleepiness. The best dietary sources of tryptophan are seeds, brown rice, dairy products, eggs, pulses, chocolate and brewer’s yeast. You may want to combine Advanced Sleep Formula with a tryptophan supplement such as L-Tryptophan. If you think stress is at the root of your sleep problems, it may be better to combine it with PharmaGABA®. If it’s pain that’s keeping you awake, then choose the excellent formulation Natural Pain Relief. Why should you take Advanced Sleep Formula for your sleep problems? the only excipients it contains are completely natural: rice flour and acacia fibre. How should Advanced Sleep Formula be taken? It’s best to take one capsule with a little water, half an hour before bed. This product should not be used as a substitute for a varied, balanced diet and a healthy lifestyle. It’s important to follow the directions for use, the recommended daily dose and the ‘use-by’ date. It is not recommended for women who are pregnant or breastfeeding, or for children under 15. Keep out of reach of young children. Store in a cool, dry place. (7) Akhondzadeh S, Naghavi HR, et al. Passionflower in the treatment of generalized anxiety: a pilot double-blind randomized controlled trial with oxazepam. J Clin Pharm Ther 2001 Oct;26(5):363-7. (8) Fernández-San-Martín MI, Masa-Font R, et al. Effectiveness of Valerian on insomnia: a meta-analysis of randomized placebo-controlled trials.. Sleep Med. 2010 Jun;11(6):505-11. (9) Bent S, Padula A, Moore D, et al. Valerian for sleep: a systematic review and meta-analysis. Am J Med. 2006 Dec;119(12):1005-12. (10) Buscemi N, Vandermeer B, et al. The efficacy and safety of exogenous melatonin for primary sleep disorders. A meta-analysis. J Gen Intern Med. 2005 Dec;20(12):1151-8. (11) Brzezinski A, Vangel MG, et al. Effects of exogenous melatonin on sleep: a meta-analysis. Sleep Med Rev. 2005 Feb;9(1):41-50. (12) Manchester, L.C., Tan, D.X., Reiter et al. High levels of melatonin in the seeds of edible plants: possible function in germ tissue protection. Life Sci. 2000 Nov 10;67(25):3023-9. Other ingredients: Acacia gum, rice flour.